Fir is essentially an electric ship. While Fairbanks-Morse main engines turn the screws, every other motor is electric and all the heating is resister based. Fir's native electricity is 440 volt, 60 cycle, three phase alternating current, This is a common voltage for ships. It is less common in the yacht industry. Equipment operating at 110 volt AC single phase is much more widely supported and less expensive. At the same time, trying to change the entire system to 110 volts would require a massive rewiring which is expensive This is a slippery slope we want to avoid. The first question is how to integrate the new system. The easy route is simply to tap into the existing system at panel route 110 volt panels (just past the transformers). This is the least expensive option in terms of the new equipment required. But, it means that we will have to operate the existing Detroit Diesel generators any time we are moving. And, it means that the new system will not cover our emergency devices like fire pumps and dewatering systems without rewiring. The other option is to replace one of the Detroit Diesels with a new system that will memic the old system. So, we replace one of the Detroit Diesel generators with a new generator system and inverters that produce 440 volt three phase alternating current. The advantage is that this does not require changes to other systems. The difficulty is that the systems that we have been considering are not usually offered in this voltage. In the end the choice is simple, we have to piece together a new system that will memic the existing system. Panel configuration after the 1988 refit. 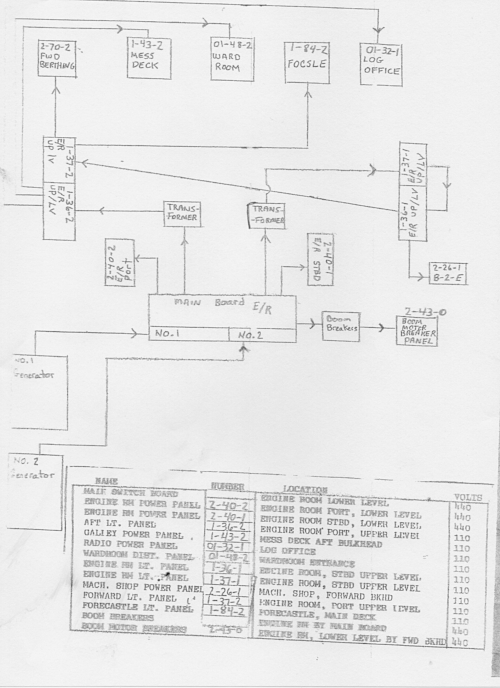 This handwritten layout was taken from the engineer's log in 1992, and is essentially the system we found existing in the Spring of 2017.